One of the criticisms professional sports players receive is that they’re paid millions to play “a child’s game.” This is to discuss one aspect of why professional athletes receive high compensation: Accountability. I’ve spent considerable time discussing why I think professional sports at the highest level is just not playing a “childs’ game” – if you really think they’re playing a child’s game, I would direct your kind attention to some Little League baseball. Please do report out when you get back. Here’s but one defense of high salaries. Please note, however, that I do believe – as in any industry – there are those who under perform their salary, there are those who outperform their salary, and those organizations who have no idea how to compensate or evaluate. Tell me the last time you heard anyone reference Roger Clemens’ little league or high school pitching statistics. That’s right, you haven’t. Over a 5 year career between 1938 and 1942, Leonard Barnum played 52 games and started 21 of them for both the New York Giants and the Philadelphia Eagles as a punter, and quarterback. You can find his statistics in as much detail as was available in the day, which weren’t much, but then again they weren’t paid as much. You can look up the 1910 statistics on Nap Lajoie. In fact, you can look up just about any player who has played any professional sport ever and see what they’ve done when the lights come on. Nap died 50 years ago, yet we can find out what he did in any given season; as we get more sophisticated, we know what any player did on any given date in any given day. There’s been a level of accountability in sports for as long as there have been professional sports – some more rudimentary than others, but the numbers are there. Today, we’ve got home/road splits, slugging, first pitch, second pitch, against lefties/righties, all sorts of minutia and all sorts of derivative statistics which will live on for as long as anyone cares about a given sport. I’m not arguing that one has caused the other – in fact, I don’t much care which came first – I am however arguing there is a correlation: a statistical strength of relationship, but not a causal relationship. As with any job that carries with it a high salary, there are expectations and is accountability. To pull down that six- or seven-figure salary, you’ve got to be able to demonstrate performance on specific metrics: shareholder value, income growth, expenses reduction, etc. We can argue whether or not sports metrics are meaningful, but we can’t argue that we could indeed – were we so inclined – to track just about every pitch Curt Schilling has ever thrown, how many innings thrown, how many pitches per inning, wins/losses, hit batsmen. How many of us have that level of accountability in our jobs? How many of us could account for every minute of every work day we’re on the job with definable metrics? How many of us would have a significant amount of time in the restroom or at the coffee machine? For sure, pro athlete stats are tracked on their game performance and not necessarily what they do on the job, but off-field, but rest assured, they are fully accountable for what they do before, after and in preparation for the game. The meaning of the numbers – comparisons across different eras – is up for debate, but each athlete’s performance represented as quantified statistics is there for all time. I cannot think of any other profession where there is such a high degree of accountability. Afterward: This is a post I had written in February/March 2008 and recently just uncovered. I’ll post them as I cull through for the most interesting among them. Happy 10 year anniversary! Parents cannot receive enough helping guiding their children’s growth through reading. This article seeks to look at the meanings of five different children’s books through a slightly different – perhaps the adjective would be “twisted” – perspective. An antagonistic marketing representative named Sam has the unenviable task of promoting a less than esthetically pleasing food product; Pushes envelope and bounds of legality by badgering his target into eventually trying his edible wares. An apparently recalcitrant child attempts to avoid going to sleep by diverting attention to every minute detail in his unkempt and unsanitary room – mice inhabit the place and leftover food remains in it’s tableware on the nightstand. Of note, a live fireplace in the child’s bedroom remains ablaze as the child is going to sleep, indicating negligent parental role models. A journey into a narcissistic, underachieving child’s complaints around how badly a day has gone for him; failing to understand the complaints of those around him – for instance the teacher can’t understand how an invisible castle would meet the stated requirements of the school project causes the child stress. His life is that much more difficult than everyone elses’. This story perfectly illustrates why children are not to be allowed unfettered access to crayons and other such playthings, particularly near bedtime. This is another story of lax parenting as Harold’s parents are no where to be seen as he goes on a journey while he should be sleeping. In fact, he is so tired, he hallucinates his journey to vast places created simply by his crayon; ultimately growing so tired he draws his own room and goes to sleep. A story of a gluttonous caterpillar apparently suffering from some form of the eating disorder pica. By the end of the week the caterpillar becomes so completely obese, there is little for him to do to cure his stomach ache but to literally build a cocoon. Carries the warning of overeating and obesity to children. Afterward: I found some old blog entries I’d written some years ago, that I’m planning to cull through. This one was written February 29, 2008, so it’s really only just about 3 years old. The funny part is that just before the race started, I was trying to point out the “Care Bear,” but he was otherwise cloaked in anonymity amongst everyone wearing the green race shirts discussed below. Photo Credit: Kim Gordon. I haven’t been “into” 5k’s very much in some time – I run my running club’s weekly 5k races, but other than that I haven’t been seeking them out. I’m trying to be more of a longer distance runner — I’ll choose a longer distance over the shorter most times. I was asked to run with the primary sponsor, Sneakerama, so why wouldn’t I do that? As an aside, Sneakerama is a small, local business that just does some really great running centric stuff: Steve sponsors a lot of local races, does a free weekly “fun run” from the store, packet pick ups for races. Things like that. And look at the Yelp and Google reviews. Steve conducts his business the way you would hope a business owner would: he gives back to the community, and doing good by the community is always good business. Race shirts, stylized after Glasgow, Scotland’s Celtic FC’s kit – or, for we Americans, Celtic’s soccer uniform. The Celtic 5k is part of a trifecta of “St. Patricks Day” races in the area, and there’s usually a pretty big turn out so they do a nice job of swag. It’s a fun take. The best part of the day was that the family got involved too: the kids both registered and my wife volunteered giving out the Celtic FC stylized shirts. Someone is dubious either about taking the selfie or about the race – I’m not entirely sure which. Note the photobomber on the left giving the rabbit ears. Smooth move there, Farkus. It’s a very simple, flat(ish) and fast, out-and-back course. As a large race, it caters to runners of all skill levels and abilities: it’s more about the party than the race itself, and that’s fine. As I said earlier, it’s a good time. When you’re finished, you get some finisher swag, a bottle of water, perhaps a banana or a slice or two of pizza if you want it. Beer? Hell, yeah. This is Worcester. There are no less than 15 official after-parties and a beer garden. A quick warm-up around Worcester’s Elm Park and I was ready to go. Good as clockwork, the National Anthem played, and at 11 AM sharp, the horn sounded. The first mile was smooth. I thought it would be more difficult getting past some of the slower folks that some how decided it was a good idea to crowd the finish line, but it didn’t play out that way. Dodged and weaved, ultimately finding some clear running room. When my watch buzzed after a mile, I couldn’t believe how fast a pace I was running: 6:58. Mile 2 was a little less speedy, about 7:2. I was struggling a bit as the first mile and a half or so was a slow ride down hill, a turn around to start the out and back meant that the distance we’d been running slightly downhill was now slightly uphill…although when I’m going up, it always seems far more significantly up than it was going down. #Perception. Team Sneakerama: For the Long Run. Now into mile 3, I was definitely feeling it and were I not racing I would have slowed, walked, or maybe even paused the Garmin, today I pushed through. Where yesterday I emotionally gave up, today I doubled down. I was angry with myself after the race yesterday and I was determined not to be that guy again today. I was far too close to a personal record that I was not going to give it up. Over that last mile, I went back and forth with one of the guys from my running club. He usually bests me and the fact that I was even close to him was exciting (and yes, he’s in his 60’s and crushing it on a regular basis. He went by me at the turn, I went by him a little before the second mile marker, he came up behind me and offered some encouragement as he went by, and just past the Mile 3 marker, the finish line in sight, I pushed through, passed him, and crossed the line in a personal best 22:46. My goal was to beat yesterday’s time, and get as close to 23-Minutes as possible. I was suffering at the end, I mean it took a LOT to push that last 0.1 mile, but it happened for me today. Who knows if I’ll ever run another 5k that fast, it’s not easy for a squat guy with stubby legs to move that quickly – a runners’ build I do not have – so I will cherish the feeling of today. Where the course direction usually alternates between Clockwise and Counter-Clockwise, this was the second straight week of Counter Clockwise running. It’s a safety issue the RD puts into place when the course has snow pack or otherwise sketchy conditions: when the course isn’t fully clear of snow, it makes sense to run against traffic to be sure cars can see you, and you them, when there’s a spot on the course that may result in some last second corrections. Such as it was today after a pretty hefty snowstorm Thursday. It was pretty cold this morning, chilly – upper 20’s, low-30’s – but the wind…oh, the wind was blowing just making it very chilly to be out in running clothes. I did a couple of one-mile warm up runs around the Worcester State campus: nothing too fast or strenuous, but just enough to warm up the muscles, wearing a warm up jacket to get used to the wind and cold. 12-Seconds away from another goal: to get below 24:00:00 on this course. And then, almost just like that, it was 9 AM. Runners’ set! Go! And we were off. While I wasn’t thrilled to be out there running this morning, I set off at a pretty good pace – I ran the first two miles faster than I have run any two miles: 7:16 and &7:28 – but consistent with the approach I’ve been taking lately with these short races (go all out for as long as I can and just try to keep pushing it), long about mile 2.7 the wheels just came off. I actually marked the point on my watch so I knew the point at which I had pretty much given up. The first .7 of that mile I was running at 8:03 – which, had I kept my mind on, I would have crushed my first sub-24 minute time on this course. The rest of the course I ran at an 8:29 pace. Worst? At the very last second, the guy behind me came and sniped my place. I deserved that, and frankly had I realized he was there, it wouldn’t have changed anything: I was beat. Coming around the last corner and down the final 0.1 mile stretch, there was this headwind that combined with my relative exhaustion made it feel like I was moving in slow motion. Positives: I’m very close to cracking that 24-minute barrier on this course. Today I came 11-seconds short. 11 flipping seconds. Gah. All because I was satisfied with what I had done to that point. I couldn’t push it further for 0.4 more mile. That’s going to sting for a bit, but will hopefully motivate me for tomorrow. I started this post in 2012. I’ve come back to it a few times in the intervening six years, to the point that I’m not sure what caused me to start it, where I was planning to go with it, what my intention was behind it. It had no title – it sat as a “draft” known only as ‘Untitled’ as it sat. Writing is an interesting thing: sometimes it takes ideas years to percolate and come to their own meaning. Ironic, really, that it takes so much time and energy to process these thoughts on being present. Sometimes it’s not as ironic as all that: sometimes its the serendipity of finding relevant ideas in a seemingly unrelated book. This entry is really the result of persistence, coming back off and on over a period of time – enough so that when the right inspiration came along, I knew how to apply it. And thus it begins with a question: What makes one happy? I don’t mean a funny joke, or laughing with old friends. I don’t mean pleasurable. I mean generally happy. The kind of happiness that at any one moment of clear presence, you realize you’re smiling or content. The happiness you feel when you’re alone with your thoughts, no one else around, no media to distract, and you realize you’re happy. I spend a lot of time alone in my head – to the point that a lot of people think I’m aloof, until they get to know that is an outside wrapper and that I can be a warm, engaging and caring person. Introverts are often like that: larger groups, where the potential for the spotlight of attention being focused on you at any given time can give you the heebie jeebies, but smaller groups of 1:1 interaction on meaningful, deep interesting topics are energizing. I think I’ve gotten better about that over the years, but it’s still difficult for me to break the ice. I’d rather mull ideas over, and get lost in my thoughts. In that alone alone time where I do get lost in thought they’re not overly deep thoughts, not pondering the nature of the universe or heavy, complicated concepts. Its actually super easy to just live in that place. But that’s the issue; its easy. There is no achievement, there is no improvement. Ed Catmull citing research in his book Creativity, Inc., says that “mindfulness helps us accept the fleeting and subjective nature of our thoughts, to make peace with what we cannot control. Most important, it allows us to remain open to new ideas and to deal with our problems squarely.” It’s that proclivity to dive inside myself that keeps me from being mindful, and perhaps content. Happy. Catmull also visits the idea that meditation could actually lessen physical pain by helping people to be in the moment: by being in the moment, you shut off your monkey brain from overthinking and mulling over what the perception of pain should be. Now, there is a fundamental disconnect between “thinking” and “feeling;” the two don’t necessarily share a vocabulary, and feelings are fundamentally different than rational thoughts, but I do try to think about what I’m feeling. I spend time thinking about what’s causing me to feel a certain way – it seems almost disconnected, doesn’t it? Like a scientist observing a subject. And that’s where I’ve been going wrong – I just need to experience, not think about it. Just. Be. In. The. Moment. While it does seem disconnected, it is important, because its not even really about discovering the why of the emotion, but rather realizing that it’s being felt. Being present. Looking around, taking myself off autopilot, and observing. When you’re so inclined as to spend that much time in your own head, it becomes very easy to be oblivious to the simplest things going on around you. When you’ve owned a pair of shoes for a while, you notice a wear pattern on the soles. Yet, it’s not likely that you’ve ever consciously thought about how your feet hit the ground each time as you walk. Often the greatest release of stress can be just taking that deep breath, coming out from yourself, and looking around; taking in the air, the sights, realizing what you’re doing. Feeling how those feet hit the ground. And you realize, you’re happy. Content in your existence. And so there it is: 6 years of percolating these words and the idea eventually reveals itself to be presence. Not feeling.Not thinking. Not introversion vs. extroversion. Just being present in the moment. I’ve never really been much for guns. I’ve never owned one — never really had an interest in owning one. When I was a kid, my dad had a rifle buried in the back of his closet. I know he had a FID card, but to the best of my knowledge that gun never left that closet. He was an older parent, born in the early days of the Great Depression, and life was very different then. I’ve never hunted, never wanted to. I grew up in the same town my dad did, some 40+ years later, but it was a very different place. Almost city compared to the suburban town where he came of age. We didn’t go hunting, we didn’t target shoot. I can’t say I ever shot a gun other than a paintball or BB gun until last year. They’ve never really had a place in my life in anyway other than in concept. My own philosophical bent is libertarian leaning, perhaps more of a constitutionalist than a libertarian. I’d prefer the government have less authority and control in our lives, with governmental authority to be strongest at the most local level and radiate outward. Frankly, I think we’ve come far too far in granting the Federal Government power: we’ve gone from a founding set of principles that granted a limited scope of authority to the government where the people had to grant government authority, to one where now the government grants authority to its citizenry. At any rate while firearms were tangential at best in my life, my wife’s experience with them was far more clear and present. She grew up at a time and place where the people with guns weren’t the people you wanted with guns. The city was rife with gang conflict and drugs and gunfire, along with all of the foreseeable consequences thereof. Needless to say, neither of us have had much interest or use for firearms. Early on in our marriage, we moved to the Central Massachusetts: a place much different from the urban eastern part of the state from where we both grew up. There is an active sportsman community here: people hunt and fish, the corner store actually sells live bait next to the potato chips, “right to farm community” means that people actually do keep chickens in their yard (a not insignificant issue when your new neighbors decide that’s exactly what they’re going to do, but that’s a topic for another day). So, we’ve long been settled down in this sleepy bedroom community in Central Massachusetts, raising our family. It’s at the point of no return that we learn that our child is clearly not growing up in the same place we did. He’s actually interested in sportsman activities: Fishing. Shooting. This community is Everytown, USA. There are gun owners everywhere. We had NO idea, I mean like none. It’s never been a thing, and now…well, now it is. If the boy is into guns, then we decided we needed to get him (and us) an education. At the end of the day, it is a part of American life and part of an ongoing debate in American life. But there is where the conflict begins. We found a training program at a local fish and game club, underwritten by Winchester and the NRA. It’s a program dedicated to the sport of target shooting, of which gun safety and maintenance is a major component: the safety rules are strict and non-negotiable. At the end of the day, if your kid is going to learn about guns, these are the people you want teaching your kid how to use a rifle. If your kid spends any amount of time playing Xbox first person shooters, she or he is learning about guns. Given this is Massachusetts, we’ve gotten some push back from friends and family about exposing him to guns and, likely more pronounced than that, the NRA itself. The NRA is a polarizing force in American politics. It hasn’t always been that way, but after the 1968 gun control act, the group’s internal politics began fermenting two opposing groups, the activists eventually took control in 1977, but the sportsman faction remains a substantive portion as evidenced by this program. In the time he’s been participating there have been two mass shooting events, and with each one in the news the questioning of our participation increases in volume and scale. This irritates me because it’s exactly what I find wrong with our politics. The argument goes that we’re participating in a program subsidized by the NRA and therefore part of the problem: we’re teaching our son how to use a firearm. Yet, it’s exactly the education he’s getting that would prevent such violence. He’s learning respect for the power of the weapon, how to use the weapon, how to maintain and care for it. In other words, he’s learning how to be a responsible and skilled gun user – perhaps owner. Exactly the sort of person envisioned in the Second Amendment. There is no simple solution to American gun violence. There is no one panacea. No one law that will fix everything. There isn’t a pot of money that will fix the problems. Background checks will not fix everything. Banning all guns wouldn’t fix everything. Increasing access to firearms, creating incentives for teachers to carry guns would likely make schools less safe, “Hardening” (presumably “soft”) schools would only create a siege mentality and one I’m not interested in engaging. No, what strikes me is that education is probably one of the most important things we can do. Respect the weapon. Which is probably the only thing we do have – a gut feel – because in 1996 Congress (at the behest of the NRA) prohibited the CDC from researching gun violence. So, without any research, we only have polarizing arguments without facts. In that environment we can only engage behaviors that seem correct. No one has any facts. You can’t refute “the only thing that stops a bad guy with a gun is a good guy with a gun” because there’s no data to support you – but that’s okay, because there’s no data to support the opposite either. Just anecdotes. Troubled personalities, rigidity, isolationist, anger and access to semi-automatic weapons. In this case, Unruh was declared to have paranoid schizophrenia. 17 years later, a gunman opened up on the University of Texas, Austin. This combined with the assassinations of John Kennedy, Robert Kennedy, Martin Luther King Jr, presaged the 1968 Gun Control Act. Which in turn mobilized a militaristic faction of the NRA as I mentioned earlier. A bit of Newtonian political physics that hasn’t stopped reacting. Which brings me around to the original point. We’ve made his participation in this program the only way that he will get the opportunity to use a weapon. He takes it seriously and he respects it. Yet, the push back we get is real. Why would we want him to use a gun? The answer is that we don’t necessarily, he wants to learn how to use one but if he’s going to use one he will learn how to do so responsibly. Of the people I know who use guns, they are responsible and use them responsibly. If he is going to use one, he will learn to be responsible. It seems to me that is the activism the NRA should be engaged in: creating educated, experienced and responsible gun users. And it is this education that we really should be encouraging, not pushing back against. We’re so polarized that we can’t even see the middle ground that makes the sense, a balance that could possibly slow that Newtonian reaction. The landscape is complex, the NRA is neither all good nor all bad; its important to remember that ambiguity. This shot in no way conveys what all the previous 10 minutes meant in terms of falling down, but fighting through to complete a goal. This was a long, challenging race. It was something I had set my mind on last year: I had been contemplating doing the full race, but friend of mine had said he wasn’t ready to do the whole thing and I did a 2-man relay with him. As it happened, he was far more prepared for the 15k distance than was I and I’m quite sure I never would have finished or at least wouldn’t have finished in anything approximating a respectable time. This year, I was sure I was ready for the challenge. This would be my longest street race, and as it turns out my longest street run too, something which even the most uninitiated among us should recognize as an issue: you really can’t properly train for a race when the race itself is longer than the preparation you’ve put into it. I’ve been averaging 35-or-so miles a week, but my long runs have been about 10 miles a piece and a luck would have it, my first 10 miles or so have been pretty good: my 5k times have been really good…my half marathon times alright. This one? Adequate. While anticipated, the cramps that hit me just after mile 18 (an official 30k would be 18.6 – this registered on my Garmin as 18.8) were not anticipated. I’d made it this far, what could go wrong? The course itself loops around the Wachusett Reservoir. Built in the late 1800’s- early 1900’s, it was the largest body of water in Massachusetts until the Quabbin Reservoir was built. Beginning in Clinton, through Sterling, into West Boylston, then Boylston, returning back to Clinton. The elevation gain is just under 1100′ according to my watch, but the gain/loss isn’t really the story. It’s HOW the gain/loss is distributed. There’s few flat stretches: you’re either going up or you’re going down. It’s not easy. 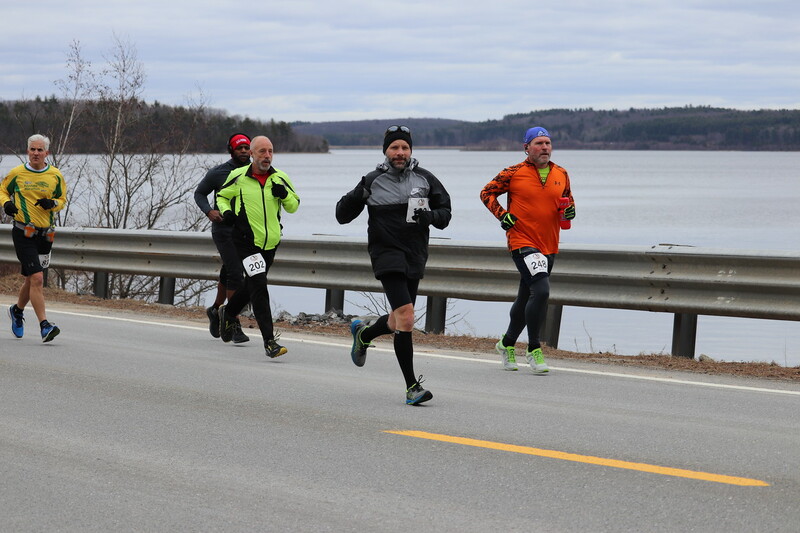 Here I am busy not dying and getting ready to kick over the mile marker as I approach mile 12. Photo Credit: Cyndy Curley. I was generally keeping my pace pretty well through about mile 9, when I began to get markedly slower. At mile 17, I got markedly slower still. Mile 18 and beyond was my slowest stretch, a good portion of which was uphill and with my poorly planned training it’s not at all surprising. What was surprising was about 0.4 miles from the end, I got hammered with a cramp in my calf. Down I went. Then my gut. It took a bit to get back up and moving. There was never a point when I was feeling good or comfortable, it seemed like it was a personal struggle from mile 4 on. I consider that to be a personal victory: staying well out of your comfort zone for a long period of time is growth. I could have done better: I could have trained harder, I could have run harder, I could have been better prepared over and above what I had already done to prepare. But I didn’t. What I DID do, though, was gut it out. I wasn’t comfortable up through mile 10. I was downright uncomfortable from at least mile 14. Physically in pain at Mile 18. BUT it got done. I stuck with it when it would have been easier to quit. Then again, had I been willing to quit under these circumstances, I likely wouldn’t have come to this point: I wouldn’t have been in position to run this race in the first place.